Distributor: Licensed by Nippon Ichi Software America, but also available streaming on Crunchyroll and Hulu. Notes: Adapted from the manga by Kuroha, serialized in Square Enix's Gangan Online. In highly social Japanese culture, belonging to a school club is practically a requirement; those who elect not to belong to a club are contemptuously referred to as members of the "going home club". 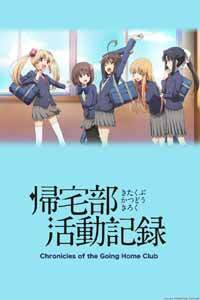 For Natsuke Andou, though, there's still no escape, for in her school the "Going Home Club" is an actual club, in which five girls (including her) spend most of their time in meandering free-association and nonsensical speculation. Sometimes they halfheartedly take brief stabs at pointless projects. With a few notable exceptions, which I'll get to later, that's about it. My wife once told me about a Spanish class she took where the instructor spent an entire class trying to explain a joke told by by the famous Mexican comic Cantinflas. It was a play on two words that sound the same in Spanish, but despite the teacher's best efforts the class never really understood why it was funny. Culture-specific and language-specific humor often just doesn't translate well. Our nominal heroine is Natsuki. She is chiefly distinguished by three traits, which is one or two more than any of her clubmates have. Number One is an incredibly large hair antenna. To me it looked like a plant stalk; the club girls bombard it with culture-specific abuse later on. Trait Number Two is a tendency to shout in outrage at- well, EVERYTHING. One of the girls says something outrageous, Natsuki shouts; one of the girls says something innocuous, Natsuki STILL shouts. Natsuki's loud interjections are so commonplace that the animators got tired of drawing her and started representing her with Natsuki Shorthand- as just an inset of her antenna. Since she's the new girl in the club, she's frequently abused by the others. One might feel guilty about being amused by something like this- and I confess I DID smile at the role she got relegated to in a game of Kick-The-Can- but you don't need to feel too sorry for her; for Natsuki's Trait Number Three is physically abusing her younger brother and treating him like a slave. Between the hair, the shouting, and the sibling bullying, Natsuki seemed to me one of the least sympathetic "heroines" ever. As noted, the rest of the girls are completely defined by only one or two traits. We have Botan Oohagi, allegedly a martial artist who fights bears (seems to me there was another character in a bad anime reviewed on this site who did that as well). She's supposedly super-strong, and she is allowed to demonstrate this a couple of times, which is just as well, as otherwise I'd suspect she's just a complete poser. Then we have Claire Kokonoe, whose defining trait is that her family's so rich that her daddy can buy anything for her. She also has a bit of an obsession with another club member, Karin Touno; it's not exactly a yuri thing, she just finds Karin incredibly cute. As for Karin, she's the Sweet, Demure, and Dull girl, a domestic-goddess-in-training who's an expert with both cooking and makeup- and is otherwise denser than neutronium. I didn't hate her as much as the others, for she comes across as innocently stupid, while I got the feeling that the others had to work at it. At least Karin freely admits when she's lost track of the conversation, and I know the feeling; I had the same reaction during the show. Several times each episode, in fact. And now we come to the club leader, Sakura Domyoji. She's defined by her enormous red hair ornaments and her enthusiasm. She founded the club, which she wanted to be a club that could be about anything. Unfortunately, what she really achieved was a club mostly about nothing at all. How vacuous is it? Typically the club members just sit around and idly speculate on topics like what they'd do with a bird that wouldn't sing, or why the Demon King in Schubert's The Demon King was such a wimp, and how his character could be made more menacing. These things always wind up going off the rails, and long before Natsuki's inevitable shouts of "That doesn't make any sense!" they've already stopped doing so. The crudely-drawn seal "mascot" that frequently pops up doesn't help- if there ever was a seal that DESERVED clubbing, it's that one. Even when the girls have an real project, little comes of it. Much is made of a bizarre concept called the Toka-Ton-Ton, a mysterious sound that, when heard, overwhelms the listener with ennui and causes them to lose all motivation to complete tasks. With this in mind, let's consider a typical club project. <SPOILER WARNING>. Sakura notes that "poems" are being sold by street vendors. These "poems" are just single words or short phrases, rendered in bad calligraphy on paper squares. (Perhaps this is the Japanese equivalent of beatnik poetry.) Sakura declares that the club should be able to do at least this well, but when they actually try it, well... Is it the Toka-Ton-Ton that brings us to the sorry end we see? It looked to ME like the girls simply realized that they sucked even at THIS. I might also make some dishonorable mention of the show's tinkly opening theme; and as for the line "Don't think, feel!" in the closer, I think that's rather self-serving, since the more you THINK about the show, the more you FEEL like watching something else. (4) Sakura and Natsuki in Episode Seven. Those two are alone in the clubroom, and Sakura proposes to Natsuki that they play "Word Chain"- the game where one person says a word, and the other must respond with another word containing the same sound. But Sakura adds a twist: each player writes down a secret word, and they automatically win if their opponent says that word. So the trick here is to correctly guess what word one's opponent is steering one toward and avoid saying it, while on the other hand successfully maneuvering the opponent into saying your word. This could involve some pretty sophisticated tactical warfare, and the show plays it pretty successfully. After all that had gone before I really didn't think the show had it in it, and it was a surprising comeback for Sakura, whose previous "game" was an asinine version of musical chairs that was perhaps the nadir of the show (and for THIS show that's a very low place indeed.) I even enjoyed the denouement of the Word Chain game; I felt the winner richly deserved the reward she got. But this just brings us to the inevitable question: WHY COULDN'T THEY HAVE MADE IT THIS GOOD ALL ALONG??? For let's face it, absent these few moments, these girls would have had MUCH more fulfilling lives if they actually HAD gone home, and done their homework, or read to their younger siblings, or even made some of Sakura's freaking wasabi octopus. In the end, even granting the show's good moments (and that extra star), I cannot recommend you undertake the journey to Chronicles of the Going Home Club's high spots, for they ARE few, the long, dark road meanders through mires of nonsense and pitfalls of deeply entrenched stupidity, and the sound of the Toka-Ton-Ton will dog your heels every step of the way. Recommended Audience: The show is not scatologically or sexually offensive at all- another reason I finally went with two stars here. It's definitely NOT harem- there are barely any males in it at all. (Natsuki's brother is the only named one, and he really just makes two short appearances-pity, since he seems the most normal character here.) Fanservice is limited to one brief sequence of speculative imagining (Natsuki is once again recruited as the object of exploitation for this.) Boredom is ALWAYS the chief threat to the watcher. Mid-teen and up, though I'm recommending instead two other shows with teens engaged in seemingly random activities, for the humor in these shows is much more universally recognizable and accessible, and no matter how bizarre they get, the wit behind them always shines through.